Gulliver was born in a village in England. When he grew up he became a doctor for ships. He travelled for 3 years as a ship doctor for Captain Prichard. But it was the season of rains and the ship sank. Gulliver was the only one who survived. He woke up in an island whose people were 5 inches tall. They took him to the capital of their country and finally they set him free. Gulliver helped them to win the battle with the warriors of Blefuscu. He took their ships, too! The war stopped but the King of Lilliput desired kill Gulliver. He desided to go to Blefuscu but on his way he found a boat that took him home. He arrived to London, kissed his children and went to sleep. He made a lot of money from showing some small animals he took from Lilliput with him to people! Αναρτήθηκε από μαθητές-τριες Τμημάτων Αγγλικής στις 2:59 μ.μ. ΣΤ2 μαθητές-τριες, υπεύθυνη εκπ/κός: Πηλιώνη Μ. 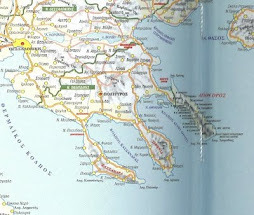 8 Ιανουαρίου 2010 - 2:37 μ.μ. ΑΓΑΠΗΜΕΝΟ ΒΙΒΛΙΟ ΤΩΝ ΠΑΙΔΙΚΩΝ ΜΟΥ ΧΡΟΝΩΝ! !